Regulatory Authority of Maharashtra (MahaRERA), which is taking big initiatives to redress the issue of aggrieved home buyers in Maharashtra, said Union Minister of State (I/C) Housing and Urban Affairs Hardeep Singh Puri said on Monday. “Maharashtra has the highest number of Projects (17,567) and Real Estate Agents (16,045) registered with Authority – higher than any other authority,” the minister added during his inaugural address while stressing on how the Real Estate (Regulation and Development) Act 2016 (RERA) has changed the housing sector for ever by providing positive solutions to the problems of home buyers and ensuring that they get their home as soon as possible. Puri said the year 2016 was a seminal one as that was the year when RERA was enacted by the NDA government under the leadership of Prime Minister Narendra Modi. 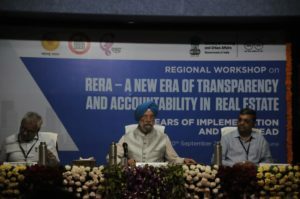 “RERA is characterised by trust, rules, regulations and regulatory oversight as opposed to the pre-2016 period which essentially was one of mistrust, fraud, cheating and broken promises,” he said and asserted that “the plight of the homebuyers who were at the mercy of the developers and bringing discipline in the real state sector was one of the core objectives of this landmark legislation”. bold and radical reforms”, which is determined to bring about a change in the lives of the honest tax payer. “We will and are urging, encouraging and persuading the states to set up the regulatory apparatus envisioned under RERA, speedily,” he added. Twenty-eight states and UTs have notified the rules under RERA, except Jammu and Kashmir, six North Eastern States (because of land issues) and West Bengal. All these states have also set up authorities (Regular – 12, Interim – 16), while 20 states/UTs have set up Real Estate Appellate Tribunals so far. A total of 21 states/UTs have set up web-portal by giving facility of online registration; and so far 31,475 real estate projects and 24,000 real state agents have been registered under RERA across the country, the minister informed. The Indian real estate market is expected to touch $180 billion by 2020 and $350 billion by 2027 – “where the products will be more structured and pre-planned”, he added. “Madhya Pradesh is fully RERA compliant state, which has established regulatory authority, tribunal and have fully functional web-portal to enable the registration of project and agents”, he said, adding that recently Gujrat has also established its regulatory authority and others (Rajasthan and Goa) are on their way to implement RERA.